GMV's award winning documentary on Arnold's early career in bodybuilding. (SPECIAL NOTE: At the time this DVD was edited, my footage of the 1971 Mr. Olympia could not be located. It was subsequently found and used in V-214DVD MR. OLYMPIA - THE GOLDEN YEARS. 1972 poolside on the Gold Coast in sunny Australia, Arnold and Franco pump and pose both individually and duo in a superb in-depth segment including more great closeups of Arnold's huge arms. Shot at the Chevron Hotel, Surfers Paradise, Qld. by Wayne Gallasch on Sunday 6th February, 1972. No other similar outdoor poolside posing footage of Arnold was ever recorded in his career. This footage was shot by Wayne Gallasch of GMV Productions and is his most well known footage from his long career in bodybuilding video and DVD productions. Wayne's still photographer that day was Robert Nailon. See Robert's photo of the occasion below. Paul Graham is shown in the centre. 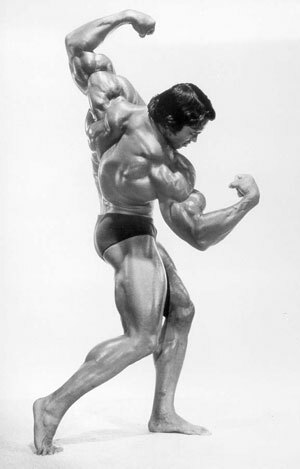 1972 was a very big year for Arnold as we see him defeat Sergio at the 72 Mr Olympia in Essen, Germany. This segment runs around 10 minutes and is the only known footage of the 1972 Mr Olympia event. 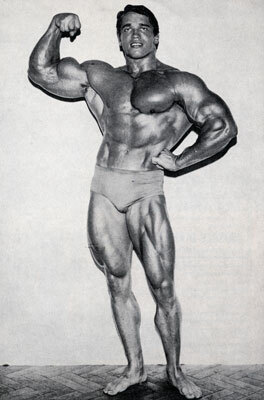 Posing also by Serge Nubret, Franco Columbu and Arnold plus posedown and award for his 3rd Olympia crown. Please click here to see the Score Card from the 1972 Mr. Olympia. In 1975 it was back to Melbourne Australia again for more guest posing, this time at the IFBB Mr Australia contest, promoted by Frank Burwash, also including posing by the winner, Roger Walker. In 1980 Roger placed 6th in the Mr Olympia. PHOTO LEFT: Arnold from 1969 courtesy Peter Fasching. Germany. See photo of Arnold and his new bronze statue at the unveiling prior to the 2012 ARNOLD CLASSIC in Columbus, Ohio. The photo of the ARNOLD SCULPTURE taken during a snow storm in Columbus, see below right, was taken by Wayne Gallasch in February, 2014, several days prior to the final Arnold Classic to be held at the Veterans Memorial Auditorium. The event will be held entirely at The Greater Columbus Convention Center from 2015 onwards. The second snow photo of the Arnold Bronze was taken by Wayne in 2015. In this historic Olympia DVD presentation, we have gathered together our rare and mostly previously unseen Olympia segments that were shot on super 8 film in the Golden 70s. As each segment seemed too short to release at the time, nothing happened till we obtained the wonderful and fantastic quality 20 minute film from the 1979 Mr. Olympia. This shows Frank Zane in his all time best condition defeating Mike Mentzer to win the Overall 1979 Mr. Olympia crown in Columbus Ohio. These are not complete Olympias but consists of the only known footage shot on film at these famous contests. All of the 3 1979 contests are exceptional quality. “Generation Iron” follows the world’s top seven bodybuilders as they fight to bring home the coveted Mr. Olympia title. The film features current Mr. Olympia title holder Phil Heath, along with Kai Greene, Branch Warren, Dennis Wolf, Ben Pakulski, Hidetada Yamagishi and Roelly Winklaar. This is the story of one of the greatest comebacks of all time. Also starring with Arnold are Tom Platz plus appearances by a number of the Mr. Olympia contenders - Frank Zane, Boyer Coe, Dennis Tinerino, Mike Mentzer, Chris Dickerson, Samir Bannout, Roy Callendar and Roger Walker. Includes scenes of Arnold training in the gym in Sydney, plus contest pump room scenes, interviews, and contest posing by some of the other competitors. Click here for details on PUMPING IRON, A-1071DVD. Click here for details on the DVD of Arnold's last contest, the 1980 Mr Olympia 2 DVD set, V-103DVDSP. Click here for the 1970 NABBA Universe, V-108DVD. Click here for Mr. Olympia - The Golden Years, V-214DVD. Click here to read Arnold Schwarzenegger's early contest history 1963 - 1966, article also includes competitive weightlifting and powerlifting history 1963 - 1968. 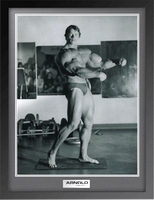 Click here to see Dr. New's complete and update contest history of Arnold, posted December, 2010. Hey guys, Just a quick note to thank you for the fantastic Arnie DVD! I am enjoying this DVD greatly. It is wonderful and worth the "price of admission." Too bad something like this didn't exist 20 years ago when I was 15 . . . Thanks again for the great product and best wishes.